Japanese Episode DP 004: "Potchama vs. Subomi! Hikari's First Battle!" American Episode 468: "Dawn Of A New Era!" Hikari is getting ready to catch herself a Mimirol, but in her rush she forgets the fundamentals of catching pokemon! The rabbit pokemon gets away, so Hikari decides that Satoshi is to blame. 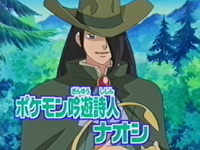 As the two bicker, a Pokemon Minstrel named Naoshi appears with his Subomi. After our heroes introduce themselves, Hikari challenges Naoshi to a Contest-like pokemon battle. At first, Hikari's Potchama does well against Subomi, but the grass-type pokemon is able to win with a Solar Beam attack. After the battle, our heroes go to a nearby Pokemon Center. As Hikari updates her mom on the status of her adventure, the Center's Joi helps Satoshi register for the Shinou League. She also tells the young trainer that Naoshi is in the process of deciding which path he should choose; Pokemon Trainer or Coordinator? Satoshi and Hikari, confident that their paths are better than the other's, leave the Center to find Naoshi. The Rocket-Dan find them first and attempt to kidnap Pikachu, but Naoshi steps in and helps our heroes send the trio blasting off again. Later, Naoshi shares his dilemma with Satoshi and Hikari; should he collect eight gym badges and compete in the Shinou League, or should he collect five ribbons and compete in the Grand Festival? Satoshi decides to win him over with a Gym-like pokemon battle, so his Pikachu faces off against Naoshi's Subomi. Even though Naoshi's pokemon evolves into Roselia during the battle, the electric pokemon is able to defeat its opponent. Now that Naoshi's participated in battles with both a Coordinator and a Pokemon Trainer, he decides to do both careers. As our heroes wave farewell to their new rival, they become more determined than ever to continue on the paths that they have chosen. The three part series opener is over, so now we jump right into our first filler! While a few things do happen in this episode (Hikari has her first trainer battle, Satoshi registers for the Shinou League, we learn that Takeshi only brought his Usohachi with him), the episode is pretty skippable. It doesn't help that Naoshi is one of the most bland characters-of-the-day ever and I really couldn't care less about his dilemma. In addition to the off-model animation, this episode also has some pretty bad writing on both sides of the ocean. The Japanese writers could have found a better way to reveal that Takeshi only brought one pokemon with him than the "Hey, Usohachi, come out of your Monster Ball for no particular reason" thing we got, and the way Satoshi randomly brought up seeing Hou'ou was irritating as well. Despite all that, I can't help to laugh at Takeshi's comments on the smoke left behind from the explosion caused by freakin' bubbles. Now bubbles have been causing a baffling number of explosions in this show for years now, but I think this is the first time it's actually been mentioned. I know Takeshi's line isn't meant to be some fourth wall breaking wink to the viewer, but it sure does feel like it. As far as the English version goes...what's up with Nando? The guy's accent is all over the place in the episode as the voice actor can't seem to figure out which country he wants this guy to be from. Ireland? Spain? Who knows? I do like that they kept Naoshi's super polite speech patterns in the dub since stuff like that usually gets lost in translation, so it's not all bad. While the music in this episode is still really bad (only four Japanese pieces), I do have to commend PUSA for not screwing up the voices of the forest scene. I really thought PUSA would blare five or six different songs during the whole thing, but they managed to leave it as-is. 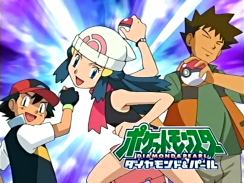 As of this episode, Together is used as the opening theme in the Japanese version. The first three episodes didn't air with an opening animation on TV-Tokyo, so this is the first episode to use it. The song is definitely an acquired taste, but I guess it's decent enough once you hear it a few times. Nyaruma, Koroboshi, Hoho, Yorunozuku, Upah, and Hou'ou keep their Japanese voices. The final set of eyecatches here shows Satoshi in his new D/P clothes. These eyecatches will probably continue to be used until the TV producers decide to start advertising the third 4th generation game. 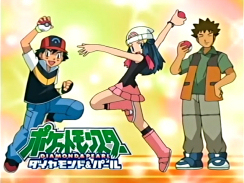 After Satoshi and his friends go into the woods to track down Naoshi, the show goes to commercial break in both the Japanese and English broadcasts. When the English version returns, however, that first shot of the forest is a second shorter than the same shot in the Japanese version. Joy: "Oh Ash, by the way, have you registered for the Sinnoh League? You'll need to." I think the effect the dub was going for is to give the idea that Joy is talking and gets cut off by Ash. The thing is, there's a noticeable pause between Joy's line and Ash's, making Joy's line very awkward-sounding and Speed Racer-ish. Nando: "Let our hearts be grateful that the mysterious world of night pokémon shows itself ever so selfishly." I've listened to that line several times thinking I misheard him and that he said "selflessly" instead, but no...I'm completely convinced that Nando says "selfishly." Which doesn't make any sense whatsoever. TO BE CONTINUED is three seconds longer in the dub than it is in the Japanese version.